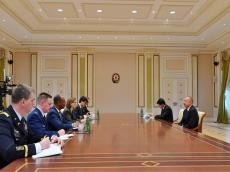 President of the Republic of Azerbaijan Ilham Aliyev has received a delegation led by Deputy Assistant Secretary of Defense of the United States Laura Cooper. The head of state hailed the successful development of bilateral cooperation between Azerbaijan and the US in a variety of areas. President Ilham Aliyev pointed out the role of reciprocal visits, including the US President’s National Security Adviser John Bolton’s and other officials’ trips to Azerbaijan in developing bilateral relations between the two countries. Describing cooperation in the field of defense as satisfactory, the head of state noted that the issues relating to energy security are of vital importance in developing bilateral relations. President Ilham Aliyev hailed the US government’s and personally the US President’s support for the implementation of the Southern Gas Corridor project in this regard. The President also noted the significance of the US President's letters on the Republic Day and on the issues relating to energy cooperation. Praising the development of bilateral ties within the NATO, the head of state described his recent successful visit to NATO headquarters as a good sign of cooperation with this organization. President Ilham Aliyev noted that Azerbaijan’s involvement in peacekeeping operations in Afghanistan and the country’s increasing the number of its servicemen in the Resolute Support Mission testify to Azerbaijan’s contribution to the overall peace building efforts in that country. Describing Azerbaijan as a reliable and stable partner, President Ilham Aliyev underlined the country's contribution to the reconstruction and renovation work carried out in Afghanistan, particularly the application of “ASAN xidm?t” experience in Afghanistan. President Ilham Aliyev expressed his hope that Laura Cooper’s visit to Azerbaijan and the consultations between the two countries in the field of defense will give an extra impetus to the development of bilateral cooperation. Saying her visit to Azerbaijan aims to continue expanding cooperation and strategic partnership between Azerbaijan and the US in the field of defense, Deputy Assistant Secretary of Defense Laura Cooper added that the leadership of the United States attaches great importance to relations with Azerbaijan. Laura Cooper hailed cooperation on preventing the spread of terrorism, weapons of mass destruction and drug trafficking, as well as security cooperation in general. She also commended Azerbaijan for supporting the peacekeeping mission in Afghanistan and creating opportunities for transit transportation to that country.